Carrots and orange-fleshed sweet potatoes are loaded with one of our most important micronutrients, one that is deficient in the diets of over 100 million people in the world: Vitamin A. About thirty years ago it became evident that vitamin A deficiency is incredibly harmful to children under the age of six, and can lead to susceptibility to infection, blindness, and death. In some parts of Africa, vitamin A deficiency has been overcome by growing orange sweet potatoes brought from America. There are sweet potatoes and there are yams, and they are about as distantly related as two flowering plants can be. Also, despite their names, the sweet potato and the round, Irish, or solanum potato have little in common; the sweet potato belongs to the same family as the morning glory and a number of poisonous cousins. Many people think that orange sweet potatoes are yams because they are somewhat similar in shape and size, and some grocery stores, particularly in North America, call them that (your favourite bar’s “yam fries” are really “orange sweet potato fries”). Sweet potatoes come in a variety of colours, and most grocery stores stock both a pale yellow variety and a deep orange one. Yams also come in a variety of colours, but they are starchier and drier, and are mostly grown in sub-Saharan Africa, where they are a dietary mainstay in many countries. Despite the labels on grocery shelves, they are not common in North America. 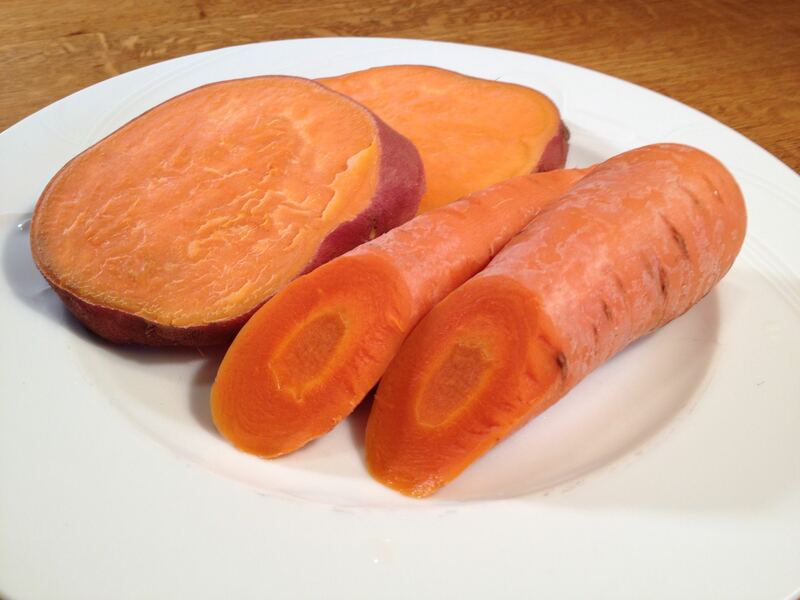 Sweet potatoes and carrots: kings of the vitamin A vegetables. There is also a profoundly important difference between yams and sweet potatoes related to vitamin A: the orange (but not the pale white) sweet potato is one of the richest food sources of provitamin A (beta-carotene), while the yam contains almost none. The colour of orange sweet potatoes reflects their content of beta-carotene, just as it does for carrots. 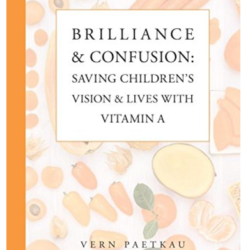 Although vitamin A has long been known as the “vision vitamin”, in the 1980s it was discovered (actually, re-discovered) that it is also essential for overall health and life itself, particularly for children below the age of 6. Among other health effects, the development and operation of the immune system, the molecules and cells in the body that protect us from infections and toxins, is dependent on vitamin A being present during pregnancy and early childhood. In 1978 it was discovered that children in developing countries who are vitamin A deficient are more likely to die, from any cause, than those who have the vitamin. The World Health Organization estimated that as many as several hundred thousand children a year were dying in Indonesia, the Philippines, India and other countries, and many more were going blind. Programs were put in place to deliver vitamin A capsules to children at risk in developing world countries. These capsules are effective, but coverage is never 100%. What is needed is a sustainable dietary sources of vitamin A. Enter the orange-fleshed sweet potato. The orange sweet potato, along with carrots and spinach, is one of the best dietary sources of beta-carotene, which is a form of “pro-vitamin A”. 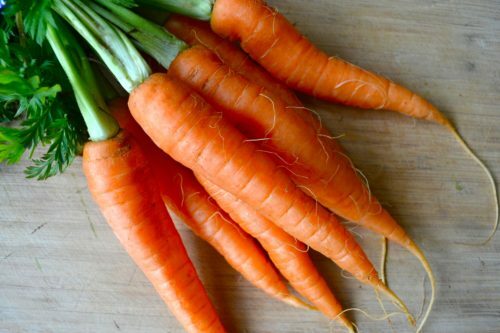 Beta-carotene from these foods is converted to the active form of vitamin A during digestion in the human gut. The beta carotene in vegetables like the orange sweet potato is an excellent way to provide vitamin A. Vitamin A itself can be toxic at high levels, but beta-carotene is safe because its conversion to vitamin A is feedback-regulated in the human body: the higher the circulating level of vitamin A, the lower the efficiency of beta-carotene conversion to it. A typical medium-sized orange sweet potato contains around 22,000 International Units (IU) of beta-carotene, but usually less than 10% of that amount is delivered to the human body as functional vitamin A during digestion. The efficiency of conversion depends on other factors, particularly the rest of the diet; a diet that is too low in fat reduces the uptake of beta-carotene. Nevertheless, the amount of vitamin A provided by a medium-sized orange sweet potato would be a little below the requirement for an adult, but would satisfy the needs of a child. Much of sub-Saharan Africa is deficient in vitamin A, with predictable results on the health of children and expectant mothers. Although programs to deliver vitamin capsules are effective when they can be brought to bear, they are incomplete, and complete coverage is essentially impossible. (Also, capsule programs are dependent on outside agencies; if their priorities change, immediate vitamin A deficiency occurs). What is needed is a dietary source of vitamin A, and the orange sweet potato is a winner: it not only provides vitamin A, it provides a high level of nourishment per acre planted. Once a farmer grows sweet potato, no capsule delivery program is needed. It has not been difficult to persuade farmers in several countries of sub-Saharan Africa to try growing orange sweet potatoes. They have been growing the white sweet potato, which contains very little beta-carotene, for years. A veritable alphabet soup of agencies, some indigenous, some originating elsewhere, have helped farmers to switch to the orange sweet potato, which in addition to providing bulk nutrition, can also help eliminate vitamin A deficiency in a long-term way. In 2007, the organization “HarvestPlus” initiated a project to provide orange sweet potato vines to farmers in Uganda. Between 2007 and 2009, HarvestPlus and its partners distributed orange sweet potato vines to more than 24,000 households in Mozambique and Uganda. In 2012, the results of this intervention showed that in both countries, as in the previous test in Mozambique, the cultivated orange sweet potatoes improved the vitamin A status of women and children (1). HarvestPlus estimates that consumption of biofortified orange sweet potatoes in Uganda could eliminate 40–66% of the burden of vitamin A deficiency, as measured by disability-adjusted life years (a standard measure of impact, calculated to determine the number of years lost to poor health, disability, or death) (2). People were informed that consumption of the orange sweet potato would protect their children from vitamin A deficiency, and that it grew just as well as the previously cultivated white version. If anything, the colour seemed to be an attractive feature to consumers, who are willing to pay a premium for the orange potato. Acceptance of the orange sweet potato in Uganda and Mozambique was 61% and 68%, respectively, within two years of introduction (1, 3). Three conditions must be met for a crop such as orange sweet potato to be useful (2): (i) the required crop must be adapted to the areas concerned, which in this case involve different growing conditions across the affected parts of Africa; (ii) the nutritional efficacy of the crop plant must be established; and (iii) people must be willing to make changes to their farming and dietary customs to incorporate it into their lives. A number of problems have had to be dealt with. There are infectious agents, mainly viruses, that target sweet potatoes, reducing yield. Early results indicated the need for more drought-resistant varieties, which could be obtained by crossing the introduced orange sweet potatoes (obtained from many parts of the world, with one of the best varieties being “Resisto” from the United States) with local varieties of white sweet potatoes, already known to perform well under local conditions. Some areas of Africa have only a single rainy season, and storage of orange sweet potatoes can be a challenge. Also, the distribution of the heavy vine cuttings used by farmers to start and maintain their crops is somewhat cumbersome. Acceptability in different countries may require different varieties. For example, a less sweet variety is being developed to appeal to the taste of people in Ghana. Finally, to achieve sufficient production, conditions that will reward growing and selling in the local market must be considered. The switch to orange sweet potatoes has been shown to increase the vitamin A status of children in South Africa (4). And in 2003–2004, a study in a resource-poor part of Mozambique showed that the intake and blood retinol (functional vitamin A) levels of children increased after the growth and consumption of orange sweet potatoes (3). This occurred despite very poor sanitary and health conditions. Consumption of the orange sweet potato also reduced morbidity from diarrhea (5). New Vision advertises itself as Uganda’s leading daily newspaper. Published in the capital city, Kampala, it has a circulation of between 35,000 and 40,000. On October 2, 2013, it featured a story about a boy named Yovani Bagirewa, aged one and a half years, who had been suffering from frequent bouts of ill health. His parents thought he might be a victim of witchcraft exercised by neighbours with whom they were having an argument about a property deal. His parents visited shrines and hospitals, to little effect. Yovani lost his appetite, suffered attacks of diarrhea, and lost weight. His mother sadly related that a touch to his legs would make him scream. Then, he came down with measles. Uganda has a high rate of vitamin A deficiency, and although a capsule supplementation program has been in place there, the coverage achieved has been estimated to be under 67%. (Reports on the ground suggest that often the official numbers are over-estimates. Remote and poor areas, in particular, are less likely to receive and benefit from such programs.) The medical staff advised Yovani’s parents to try giving him foods rich in vitamin A. Fortunately, they lived in a village, Bukokoba, where they could get orange sweet potatoes, rich in vitamin A. Once Yovani began to consume orange sweet potato, he soon regained his health. That may have been coincidental, but it fits the pattern of what has been happening in sub-Saharan Africa in the past decade. The orange sweet potato programs in Africa depend heavily on the participation of women. Women do most of the sweet potato farming, and they dominate the numbers of farmers receiving potato planting stock; HarvestPlus estimates that more than 70% of the farmers they provide with planting material are women. From the beginning, dissemination of information on the nutrition and farming of orange sweet potatoes has been an intrinsic part of programs aimed at introducing it to countries in Africa, and this educational activity is also run almost entirely by women. Hotz, C., C. Loechl, A. Lubowa, J. K. Tumwine, G. Ndeezi, A. Nandutu Masawi, R. Baingana, et al. 2012. 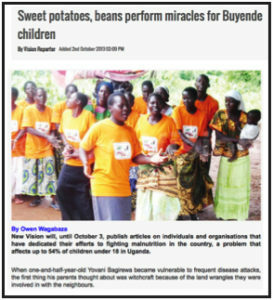 Introduction of β-Carotene–Rich Orange Sweet Potato in Rural Uganda Results in Increased Vitamin A Intakes among Children and Women and Improved Vitamin A Status among Children. J. Nutr. HarvestPlus. 2010. Reaching and Engaging End Users (REU) With Orange Fleshed Sweet Potato (OFSP) in East and Southern Africa. Final Report to the Bill and Melinda Gates Foundation. Low, J. W., M. Arimond, N. Osman, B. Cunguara, F. Zano, and D. Tschirley. 2007. A Food-Based Approach Introducing Orange-Fleshed Sweet Potatoes Increased Vitamin A Intake and Serum Retinol Concentrations in Young Children in Rural Mozambique. J. Nutr. 137:1320-1327.
van Jaarsveld, P. J., M. Faber, S. A. Tanumihardjo, P. Nestel, C. J. Lombard, and A. J. S. Benadé. 2005. β-Carotene–rich orange-fleshed sweet potato improves the vitamin A status of primary school children assessed with the modified-relative-dose-response test. Amer. J. Clin. Nutr. 81:1080-1087. Jones, K. M., and A. deBrauw. 2015. Using Agriculture to Improve Child Health: Promoting Orange Sweet Potatoes Reduces Diarrhea. World Development 74:15-24.